The past few weekends were filled with nothing but fog, low clouds and rain. Not the kind of weather I need for my flight training.. The next item on my training program was the 150NM solo cross-country flight, in practice one of the most difficult flights to make. Not so much the flight itself, but finding a day were the airplane was available the entire day, an instructor was present to sign me of ánd the weather was good enough. 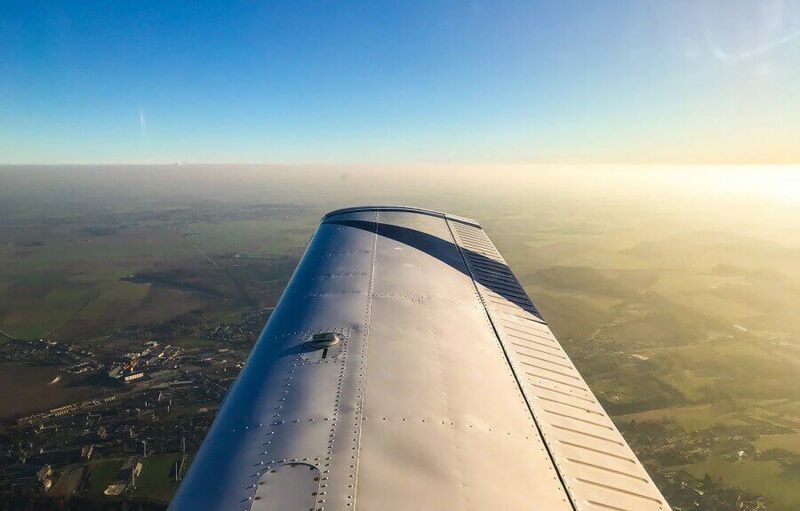 The 150NM solo cross-country is one of the required flights you have to take as part of your training and before being allowed to take the checkride. The cross-country consists of a flight of more than 150NM (278km) with two full-stop landings on airports different from the departure airport. In our flying club, they usually have students fly to the same two airports since it's an area we are familiar with during our training. To one of both airports I had been to before with my instructor, but the farthest stop on the trip, Kortrijk Airport EBKT, I hadn't been yet. The plan was for me to first book a three-hour slot with my instructor to visit Kortrijk, so I would be familiar with it for my long solo nav. I had been booking this flight for three weekends in a row, but having to cancel it due to bad weather each time. So last weekend, I had the final booking for my dual navigation flight to EBKT on Saturday and a long slot (10h-16h) on Sunday for the long solo cross-country. And I couldn't have been luckier! Cold but beautiful and calm weather both days, perfect for the amount of flying I was planning to do. Saturday was also the first day I could try out my new Bose A20 Aviation Headset. Turned out I will never want to fly again without it! After a successful cross-country flight on Saturday with my instructor, he gave the green light for my 150NM long solo nav! As always, I prepared the flight on my map and navlogs the evening before, completing it with meteo data and NOTAMS the morning of the flight. Waking up before 7 am would be more than worth it! Once arrived at the airfield (EBTN is my home base) I went over every aspect of my preparation and the flight with the instructor that was going to sign me off on my flight. We discussed the map, navigation logs, weather, NOTAMS, weight & balance and more. Since the fuel pump at our airfield had broken the day before, I would have to refuel at my first stop. Just to be sure I called ahead and they were fine with filling my tanks over there. Because of the cold temperatures in the morning (4°C), the next thing to do was to put the plane on the heater for about 20 minutes. Especially our older engines don't like the cold that much and often won't start (immediately) during a cold start. At 10h30 I started my first leg to Zwartberg airfield EBZW. The light is absolutely stunning up there, with parts of the ground still beautifully white from the frost. About 37 minutes later I landed there, had my papers signed off and refueled my aircraft. I didn't want to lose too much time there since the largest part of the flight was still ahead of me and I could take some more time to have lunch in Kortrijk. So around 11h30 I left again for the next leg. With 93,2 NM this leg was considerably longer than the first 27,3 NM, but the calm air, sun and beautiful views made me enjoy every single minute of it! Around 12h40 I landed on runway 06 at Kortrijk airport. Apparently, everyone wanted to enjoy the beautiful weather because both on the radio and on the ground it was considerably busier than any other Sunday! I took my time to register my arrival, have my paperwork signed of in the tower (to proove I actually landed there) and went to the nice airport restaurant. Great lunch with an even better view on the entire airport! Time to head back home now. The final leg was about 60 NM and about an hour of flying including departure and joining the traffic circuit back in Goetsenhoven. This long solo cross-country was definitely one of the highlights of my flight training, I'm still dreaming about it.. All in all, I added about 5,3 hours to my logbook this weekend, so a large step towards my Private Pilot License! Here's to many more cold but sunny winter days ahead of us!